Tim Mather is an experienced security professional who is currently pursing a graduate degree in information assurance full-time.He is a frequent speaker and commentator on informa-tion security issues, and serves as an Advisor to several security-related start-ups. Most recently, he was the Chief Security Strategist for RSA, The Security Division of EMC, responsible for keeping ahead of security industry trends, technology, and threats.Prior to that, he was Vice-President of Technology Strategy in Symantec's Office of the Chief Technology Officer, responsible for coordinating the company's long-term technical and intellectual property strategy.Previously at Symantec, he served for nearly seven years as Chief Information Security Officer (CISO).As CISO, Tim was responsible for development of all information systems security policies, oversight of implementation of all security-related policies and procedures, and all information systems audit-related activities.He also worked closely with internal products groups on security capabilities in Symantec products. Prior to joining Symantec in September 1999, Tim was the Manager of Security at VeriSign.Additionally, he was formerly Manager of Information Systems Security at Apple Computer.Tim's experience also includes seven years in Washington, D.C. working on secure communications for a classified, national-level command, control, communications, and intelligence (C3I) project, which involved both civilian and military departments and agencies. Tim is a Certified Information Systems Security Professional (CISSP) and a Certified Information Systems Manager (CISM).He holds Masters Degrees in National Security Studies from Georgetown University, and International Policy Studies from Monterey Institute of International Studies.Tim holds a Bachelor's Degree in Political Economics from the University of California at Berkeley. View Tim Mather's full profile page. Subra Kumaraswamy has more than 18 years of engineering and management experience in information security, Internet, and e-commerce technologies. He is currently leading an Identity & Access Management program within Sun Microsystems. Subra has held leadership positions at various Internet-based companies, including Netscape, WhoWhere, Lycos, and Knowledge Networks. He was the cofounder of two Internet-based startups, CoolSync and Zingdata. He also worked at Accenture and the University of Notre Dame in security consulting and software engineering roles. In his spare time, Subra researches emerging technologies such as cloud computing to understand the security and privacy implications for users and enterprises. 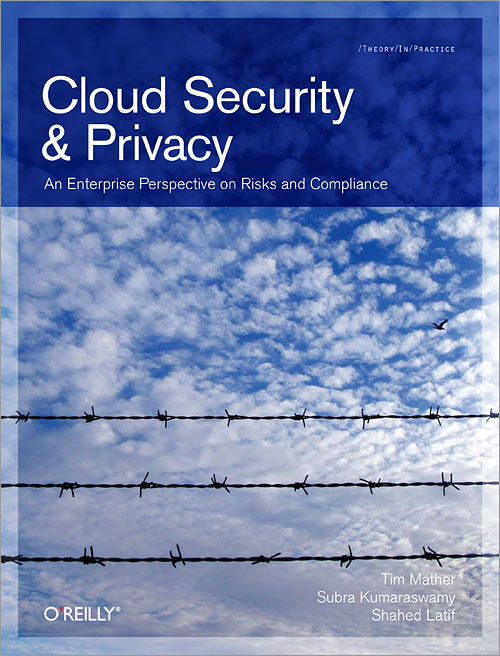 Subra is one of the authors of Cloud Security and Privacy, which addresses issues that affect any organization preparing to use cloud computing as an option. He's a founding member of the Cloud Security Alliance as well as cochair of the Identity & Access Management and Encryption & Key Management workgroups. Subra has a master's degree in computer engineering and is CISSP certified. View Subra Kumaraswamy's full profile page. View Shahed Latif's full profile page. Chapter 2 What Is Cloud Computing?